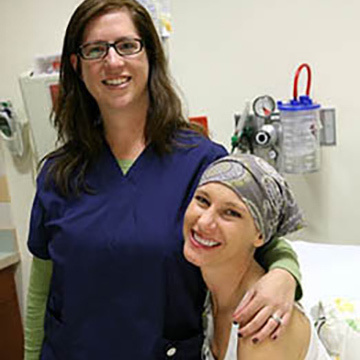 The Lynn Sage Breast Cancer Survivorship Program offers comprehensive care and management strategies for the unique challenges women treated for breast cancer face as they transition to post-treatment survivorship care. These issues include hot flashes, osteoporosis, fatigue, weight gain, depression, anxiety, cognitive impairment, sexual dysfunction, neuropathy, fertility problems and lymphedema. A long term survivorship care plan, including a treatment summary, is developed with tailored recommendations for cancer surveillance and monitoring for possible late side effects from treatment. The program promotes bone and heart health, and emphasizes the importance of good nutrition and physical activity as part of a long-term survivorship care that will enable survivors to thrive after their cancer diagnosis and treatment. Referrals for nutrition counseling, cancer rehabilitation, and other specialty services are provided as needed. The Research Program of the Lynn Sage Breast Cancer Survivorship Program, directed by Sofia F. Garcia, PhD, aims to develop and implement innovative survivor-centered assessment and health promotion tools and to evaluate their impact, and that of the program as a whole, on breast cancer survivors. The Cancer Outcomes Management: Planning Assists Survivorship Study (COMPASS) has programmed a new computerized template that can integrate information from patients’ medical records with patient responses to questionnaires about their health in order to generate individualized survivorship care plans for survivors that have completed primary breast cancer treatment. Thursday: 8:00 am – 11:30 a.m.
Friday: 8:00 am – 11:30 a.m.